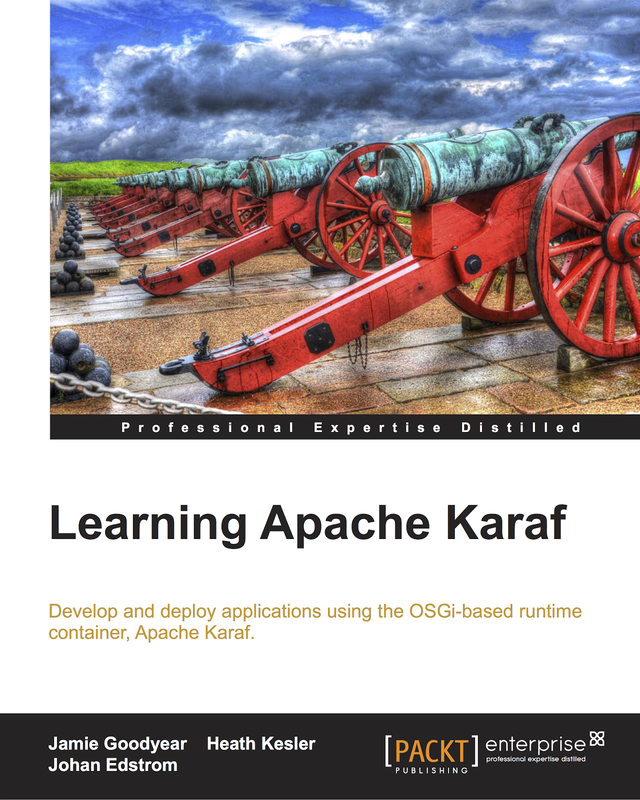 The second community testing kit release of Apache Karaf 3.0.0 is in flight towards an immanent RC, as such I'm preparing for the release management role. This testing kit contains a MAJOR refactoring to the OSGi Rev5 API and supporting libraries. This represents a substantial departure from the Karaf 2.x series releases, as such we encourage everyone to test their applications against this new runtime environment and report any Karaf issues to our Jira. My long standing bottle of Stella Bella Cabernet Sauvignon Merlot 2007 is patiently awaiting the day that all of the community testing RCs are complete and a final RC becomes available. I'll be posting updates to our Twitter stream (#karaf) and on our IRC channel (irc.codehaus.org #karaf) once the process begins. The second patch release of the Apache Karaf 2.3.x branch is in flight towards an immanent RC, as such I'm preparing for the release management role. To prepare I've selected a bottle of Vina Maipo Gran Devocion Cabernet Sauvignon / Syrah 2010 to decant while listening to some Tegan and Sara albums. Current high lights of this patch include a collection of bug fixes, a new word count command and updates to Spring 3.2.2.Release, Pax Web 1.1.4, and Pax URL 1.3.6. A complete change log will be created for the Release Candidate once the community is ready to put it to vote. Unfortunately I can't share the wine with you, but I can share a few links to some videos. I'm looking forward to starting the 2.3.2 release process soon. Karaf-1254 Jasypt config admin property with reload strategy. 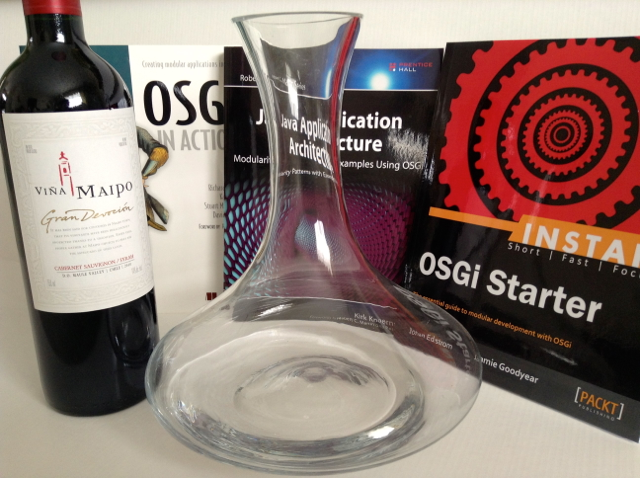 Presenting the story of how the OSGi Starter book came to be. 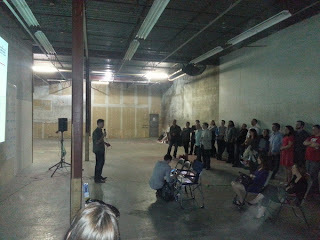 The empty warehouse is the future home of Common Grounds. 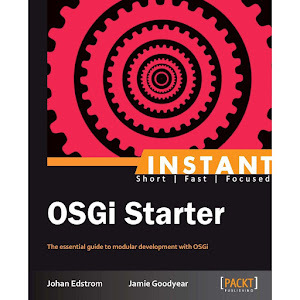 I recently had the opportunity to talk about the release of my & Johan Edstrom's book OSGi Starter at Startup St John's / Common Grounds. My talk included some back ground on my involvement with Open Source, my work with Savoir Technologies, and how the opportunity to write a book with Johan came to be (as described here). 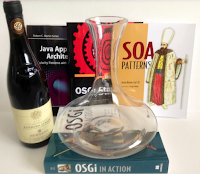 Following the back story I provided a brief overview of what we use OSGi for, and then talked about what readers will find amongst the book's pages. Before the close of the meeting night five copies of OSGi Starter were given away through door prize draws. I'd like to thank StartUpNL and Common Grounds for the opportunity to show case Johan and my book before an awesomely engaging audience. I've copied in below some back ground information on these two organizations - they're really helping to shine a light on all of the neat things happening in the city. We are a community group of like minded tech entrepreneurs who want to share ideas and help each other grow. Our goal is to help you build your business; to help get your idea commercialized. This group is for both experienced entrepreneurs and new entrants. We will share knowledge, provide advice, find investment & the resources your business requires. The group will use our collective experience and expertise to build great enterprises. If you have a technology start up or are about to start one, we look forward to meeting you. 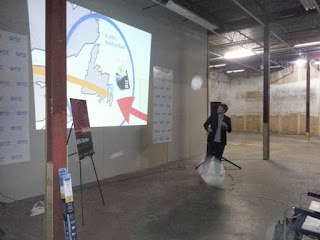 Post on our contact group by emailing contact@startupnl.com or join our MeetUp group today! Common Ground’s goal is to help unify the entrepreneurial community in St. John’s by opening the city’s first coworking space. We believe that the traditional way businesses work is broken, and we intend to change it. We want to help local entrepreneurs run their business, meet like-minded people, and find opportunities. We believe that communities empower and motivate individuals to achieve truly remarkable things. Right now, Common Ground is still just an idea and we need your help to make it a reality. If you want to change the way we work in St. John’s, join our community and get involved. When ever I'm on the road I end up talking a lot about the province, and from time to time I'll post here some NL tourism videos.. this is another one of those posts - enjoy! 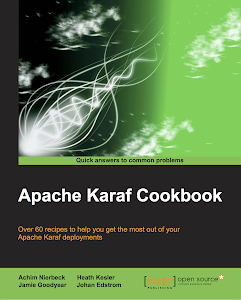 Note: Apache Karaf 2.2.11 is now available!